The Sitrex EXPLORER Pull - Type V- Rake is a medium size V-Rake. This ma¬chine is designed to obtain a maximum working width of 23'3" and windrows widths adjustable from 3" to 5'. The drawbar and the opening system are mounted over the wheels this allows to make a windrow without hindrances with the components of the machine. 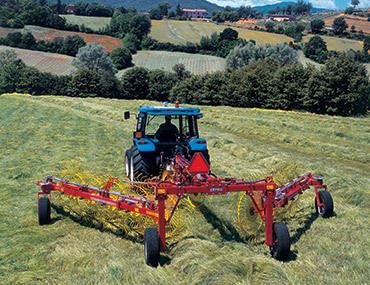 All rake wheels are spring-load lifted independently and this allows the machine to follow the ground contours. Tines are made of special steel with 7mm. diameter. Tines pick up the hay making fluffy win¬drows very suitable for ba¬ling. A double hydraulic system, tractor driven, controls both the wheels lift and the machine total or partial opening and closing. On the hydraulic cylinder, which controls the opening and closing of the machine, is mounted a locking valve to maintain the required working width. Even in case of pipe breaking the machine remains in the same position which has been set.